Who would have guessed that we would be at the beach on New Year's Day?! But that is just where we were, and loving every minute of it! 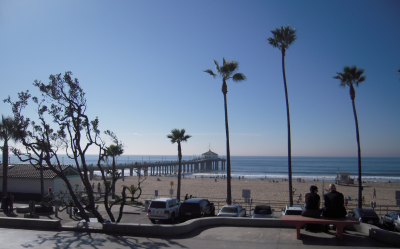 This is Manhattan Beach, CA. I love this place. This is an excellent place to surf, boogie board, swim, walk, run, bike, skate, wind skate, and play volleyball. But none of that is why we were there. We were there to breathe the ocean air, play in the sand, hop over waves, dig up sand crabs, and generate some vitamin D. We were treated to an absolutely gorgeous day! We didn't bring our swimsuits, since we knew the water would only be about 55 or 58 degrees. Brrrr! But would you believe others did? And wore them! And swam in them! In the water! In bikinis! I can understand the surfers better, in their wetsuits. Wetsuits in 55 degree water make sense. Bikinis do not. The waves were big and choppy, but that didn't deter the surfers and boarders! Quite the opposite. 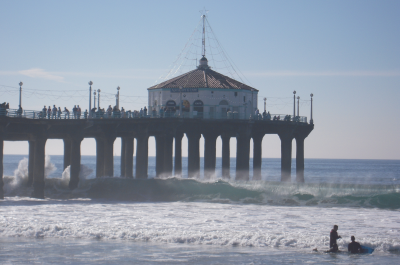 I tried to capture the waves crashing into the pier, but this is the best I got. It was a spectacular day at the beach. We got there on the early side, just after noon, and didn't leave until our parking meter was running down, 2 hours later. By that time, loads more people had shown up. The beautiful, warm weather was a big draw and with the holiday, everyone was ending up at the beach! We hadn't intended to stay at the beach the entire day. Our parking meter was down and we still hadn't eaten lunch. But we knew we needed to eat lunch before we left the area. 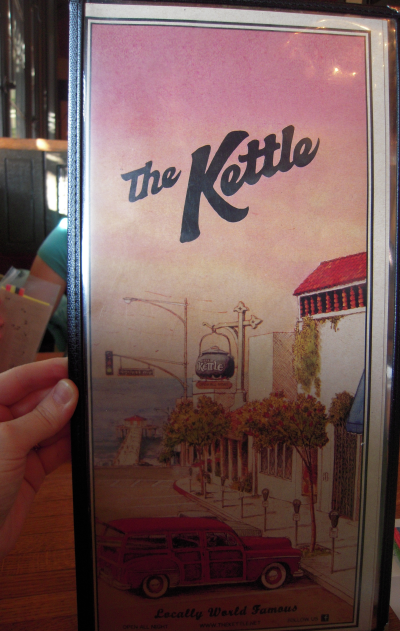 There was no debating this, because we had specifically planned to eat at The Kettle. The Kettle is a restaurant just a couple of blocks up from the beach. It is, hands down, my all-time favorite restaurant. It might be the good memories of going there with good friends during college and staying late into the early morning. It might be the outstanding food. It might be the hidden charm of an outdated coffee-shop-style restaurant. It might be the fabulous location. It might be the great service. It might be their reasonable prices for that outstanding food. It might be eating at tables on the patio outside. Back when I was in college, I didn't have issues with gluten. I could eat anything, and everything at The Kettle was good. Everything was worth ordering. Now, I have to be more selective. The Kettle doesn't have a gluten-free menu, but in talking with the manager, I was able to find something I was interested in and that would be safe for me. The manager assured me that all of their sandwiches and burgers could be wrapped in lettuce and be gluten-free. He also assured me that their corn tortillas were safe. Then he asked me what I was interested in having. After eating a bunch of less than healthy food during our New Year's Eve party, I knew I needed a salad. The manager knew off the top of his head that the balsamic vinaigrette was safe. Sounded good to me. That's all I needed to know. A couple of years ago while visiting, we took the family to The Kettle. 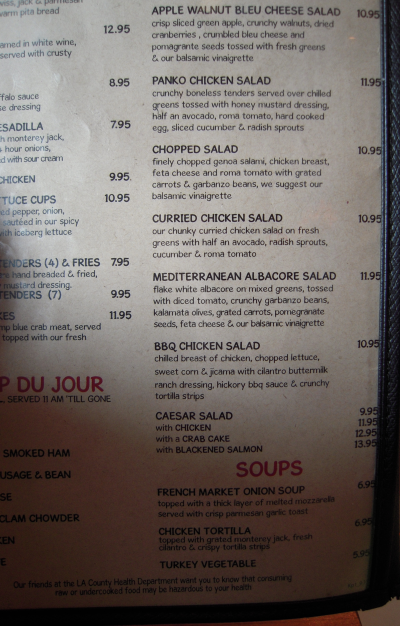 I ordered their Mediterranean Albacore Salad. I was eating gluten-free then, so I chose what appeared to be an almost-certainly-safe salad. I asked if they made their own dressings. The balsamic was made in-house and was most likely to be safe. I tried it and it was fine. But by the time I got near the end of that salad, I realized that it was missing something. Something to complete the flavors. On my way back from the restroom, I stopped to talk with the manager. I suggested that my salad needed something. "It is screaming for feta cheese." "Yes. Screaming. It really would be the finishing flavor." Shortly after returning to my table, our waitress brought me some feta cheese on the side. I had almost finished my salad by this time, so I wasn't expecting anything. I thought I was just sharing my thoughts. Having some feta brought was a genuine surprise. But that feta really did complete the flavors perfectly. And I was happy. 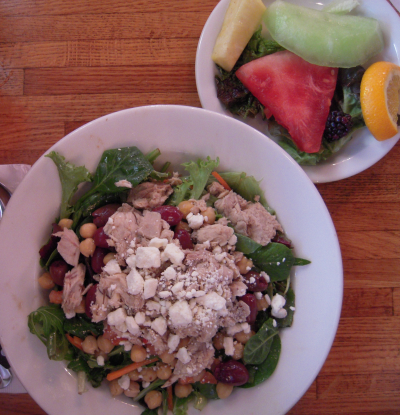 Do you see that Mediterranean Albacore Salad? Do you see what is in it? Do you see the last ingredient before the dressing? They incorporated my suggestion! Okay, so it isn't really all that original of an idea, and it is likely that lots of other people made the same suggestion. But they added the feta! Boy, I love this place! Here is the 2012 New Year's Day version of the Mediterranean Albacore Salad with Balsamic Vinaigrette, including feta cheese. Everything was fresh and fantastic. I had no problems eating here. I never have. I still love this restaurant, even though now I have to be gluten-free. I may even love it more than ever. They still take good care of me! They take good care of everyone! Thanks, The Kettle!